Biography of 19th Century Australian Painter, Heidelberg School. An early member of the Heidelberg School of Australian Impressionism, whose style of painting combined naturalism with the loose brushwork and light-focused approach of European Impressionism, McCubbin joined Tom Roberts (1856-1931), Arthur Streeton (1867-1943) and Charles Conder (1868-1909) in their plein-air painting activities around the outlying areas of Melbourne. 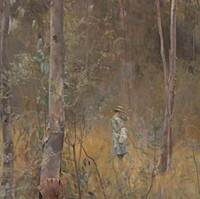 Although, like the others, McCubbin excelled at landscape painting, he was the one most interested in creating 'national' pictures which portrayed the ordinary working people of the Australian bush: people such as pioneer settlers, sheep-shearers, miners, swagmen and others, who exemplified the egalitarian spirit and rugged character of the emerging nation. Along with Roberts and to a lesser extent Streeton, he produced numerous large-scale examples of genre painting focusing on rural labour, such as Down on His Luck (1889, State Art Collection, Art Gallery of Western Australia, Perth), A Bush Burial (1890, Geelong Art Gallery), and The Pioneer (1904, National Gallery of Victoria), all of which sought to illustrate typical life in Australia. McCubbin was appointed instructor of drawing at the school of design, National Gallery of Victoria, a position he held until he died. He is regarded as one of the pioneering modern artists of the late 19th century, who produced a number of intensely evocative Impressionist paintings that captured the soul of the Aussie settler. Fred McCubbin was born in Melbourne, the third of eight children of the Scottish-born baker Alexander McCubbin, and his wife Anne. He attended William Willmott's West Melbourne Common School and, until the age of 14, St Paul's School in Swanston Street. After a short spell as a junior clerk in a solicitor's office, he worked in the family bakery business as a cart-driver while also beginning an apprenticeship as a coach-painter. In 1869 he began taking night classes at the Artisans' School of Design, Carlton, and later at the National Gallery school of design, where he studied drawing under Thomas Clark. He completed his coach-painting training in 1875, but owing to the sudden death of his father he had to take over responsibility for the family business. He managed to continue studying part-time at the school of design under O.R.Campbell and, in 1877, joined the school of painting, where he met and befriended fellow-student Tom Roberts (1856-1931). 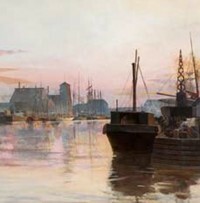 He also took classes at the Victorian Academy of the Arts, and exhibited paintings there between 1876 and 1882, selling his first work (View Near Fisherman's Bend) in 1880, at the age of 25. By the early 1880s, McCubbin's painting started to attract considerable attention and he won several prizes from the National Gallery, including a silver medal for figure drawing in the academy life-class (1882), and a first prize for best studies in colour and drawing (1883). He was also elected an Associate of the Academy. In 1886, he accepted the position of instructor and master of the School of Design at the National Gallery. In this position he taught several students who themselves would become prominent Australian artists, including Arthur Streeton (1867-1943) and the Englishman Charles Conder (1868-1909). In 1887, a number of full-time artists led by McCubbin, Roberts, and others quit the Victorian Academy of Art in 1887 and formed the breakaway Australian Artists' Association. Appointed a committee-member, McCubbin exhibited at the association's art shows until it amalgamated with the Academy in 1888 as the Victorian Artists' Society, whereupon he served as a councillor of the society and later President in 1903 and 1909. He was a regular participant at its annual exhibitions until 1912, when he left with seven other artists to set up the Australian Art Association, of which he was elected President. For an overview of the time, see: Victorian Art (c.1840-1900). Manwhile, it was during the mid-1880s, that McCubbin turned his attention to painting the Australian bush and the works for which he became famous. Ever since Roberts had returned in 1885 from his studies in London, he and McCubbin had gone on numerous painting trips around Melbourne, camping out on holidays and weekends at Box Hill, the seaside town of Mentone on Port Phillip Bay, and later in the Heidelberg area. Here they were joined by Streeton and Conder, as well as others like Clara Southern (1861-1940) and Jane Sutherland (1853-1928). Note: For more details about the style of French Impressionism, see: Impressionist Painting Developments. To paint the true-to-life landscape they sought, Heidelberg painters devoted most of their time to plein air painting, directly from nature. Roberts was the leading pioneer of outdoor work, while Streeton and Conder were also avid exponents. McCubbin was more limited in his painting-on-location due to family commitments, especially after his marriage in 1889 to Annie Lucy Moriarty, with whom he had seven children. Also, his teaching duties ruled out any prolonged absences. Thus, while Roberts and Streeton spent months painting in the Victorian outback, and in remote locations around New South Wales, McCubbin painted in more local settings such as Box Hill and Macedon, before returning home to finish off in his studio. The main reason why the Heidelberg painters tended to avoid the typical Impressionist colour palette, with its higher keyed chromatic colours, was because it was seen as unsuitable for the harsh light and unique colour of the Australian countryside. Besides, the use of non-naturalist colours was inconsistent with the desire of (in particular) McCubbin, Roberts and Streeton to produce a style of realist painting that accurately conveyed the reality of settler-life in the emerging country. They wanted to create a distinctly Australian art that captured the rugged Aussie spirit set against a true-to-life landscape. 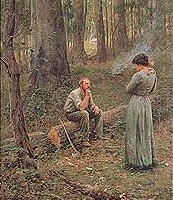 In April 1889, McCubbin created one of his great masterpieces of modern art: Down on His Luck (1889, State Art Collection, Art Gallery of Western Australia, Perth). Like Roberts' Shearing the Rams (1890, National Gallery of Victoria) and Streeton's Fire's On, Lapstone Tunnel (1891, Art Gallery of New South Wales, Sydney), the picture is wholly Australian in spirit and is one of the country's most famous landscape paintings of the 19th century. It depicts a wooded glade, with evening shadows gradually lengthening. In the foreground, a human figure sits by a small campfire contemplating his future, in the manner of a bushman or unlucky gold prospector. His sombre mood is reflected in the restrained tones of the surrounding bush landscape, and his face exudes hardship, but his nonchalance and slightly cynical expression rules out any notion of self pity. McCubbin painted the picture at Box Hill, using as a model his friend and fellow painter Louis Abrahams (18521903), and like his other works of the period it combines an Impressionist-style painterly technique with more traditional academic methods. An element of academic art is visible, for instance, in the formal definition of the figure, suggesting that at least some of the painting was completed in the studio. In August 1889, McCubbin joined Impressionist painters Roberts, Streeton, Conder, C.Douglas Richardson, R.E.Falls and Herbert Daly in holding the 9 by 5 Impression Art Exhibition at Buxton's Art Gallery, Melbourne, named after the cigar-box lids on which the exhibits were painted. In addition, he was an occasional exhibitor with the Society of Artists' exhibitions in Sydney during the 1890s, and held one-man shows in Melbourne from about 1904. He was also represented in the 1898 Exhibition of Australian Art, at Grafton Galleries, London. After the death in 1891 of the Irish-born George Frederick Folingsby (182891), McCubbin was appointed temporary director of the National Gallery until the appointment of a replacement the following year, and was re-appointed director again in 1903 and 1905. In 1901 McCubbin and his family moved into a cottage on the beautiful northern slopes of Mount Macedon, outside Melbourne, where he painted his famous picture - The Pioneer (1904, National Gallery of Victoria). It was also during the early 1900s that McCubbin began to focus on Impressionist landscape painting, capturing the lyrical beauty of the Australian bush - the early influence of Camille Corot giving way to the more expressionistic light and colour of JMW Turner. In 1907 he took a leave of absence from the gallery to visit England, where he stayed with his old friend Tom Roberts and visited a number of galleries and art schools. Unfortunately, while he continued painting into his 60s, his health began to fail with the onset of World War I. He died from a heart attack at his final home at Carlsburg, South Yarra, at the age of 62. In 1955, a major retrospective of his painting was held at the National Gallery of Victoria in Melbourne, to mark the centenary of his birth. In 1998, his painting Bush Idyll (1893) was sold for $2,312,500 - the first work by an Australian painter to exceed the A$2 million mark in a public auction. For more, see: Most Expensive Paintings: Top 20. Paintings by Fred McCubbin can be seen in all the best art museums in Australia, including: the Art Gallery of Western Australia (AGWA), Perth; Queensland Art Gallery (QAG) in Brisbane, the Geelong Art Gallery; the National Gallery of Victoria (NGV), Melbourne; the Art Gallery of South Australia (AGSA), Adelaide; the Art Gallery of New South Wales (AGNSW) in Sydney; and the National Gallery of Australia (NGA) in Canberra.  For biographies of other Australian landscape artists, see: Famous Painters.  For more details of plein-air painting in Australia, see: Homepage.